“I am so sorry.” she said after bumping into my arm. I smiled back and reassured her that it was not a problem. Apologetically she replied, “I am just walking around in a daze!” I saw that same dazed look many times throughout the day. I recognized it almost immediately. This was the look that many mothers have when attending their first homeschool convention. Knowledge plays a paramount role in choosing the correct curriculum for your family. This process of learning is never ending. For us, it began when we started our incredible homeschool adventure, over a decade ago. It has continued on through the last homeschool convention we recently attended. And in the years ahead we will continue to seek knowledge. Homeschool fairs and conventions are wonderful means to attain information but they can also be rather intimidating. In fact, for a first time homeschooler, pouring through dozens of catalogs, simply doing an internet search, or just talking with veteran homeschooling families can be daunting. There is a lot of information out there. And there are a lot of things to take into consideration each school year. What style of teaching will we use? How much money will we spend? How many hours a day or days a week will we teach? What will our goals be? And what curriculum will we use? 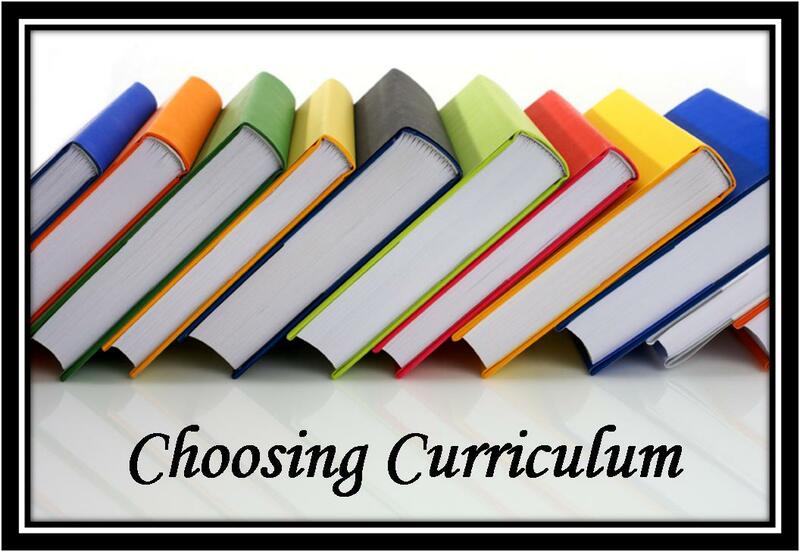 Choosing a curriculum for your children is an important task. In addition to acquiring knowledge about each product there are some key factors to consider in this choice. What foundation is it built on? The first aspect to consider when choosing a curriculum is to determine what foundation the curriculum is built on. Each family will have a different standard. For our family, it is imperative that it has a strong, Biblical foundation. The importance of giving children a Christian education is one of the focal reasons many choose to home educate. When I look at various curriculums, the subject that needs to be addressed is whether this particular study will give my children a biblical world view. The reason we ask this question is because there is no such thing as amoral education. I believe that everything our children learn will either draw them to God or away from God. We must ask ourselves, as parents, if this is a dynamic worth considering. “If the foundations be destroyed, what can the righteous do? Psalm 11:3. Does it fit our family? Just as there are many different types of families, equally there are many different types of curriculums. Some families choose a traditional home education. This is simply taking the concept of school and bringing it home. Traditional homeschooling usually includes text books, workbooks, written tests, and core subjects. Others choose to incorporate Unit Studies into their education. I have a friend who is doing a unit study through Little House on the Prairie with her three daughters. All three girls, of different ages, will get their math, language, science, history, and Bible in this study. In addition, they learn how to cook and sew throughout the year. Other families choose eclectic, relaxed, or unschooling. Still others choose the methods of Charlotte Mason, DVD/video schooling, or internet homeschooling. We have used various types over the years. I began with the traditional approach, but soon realized that my young son was less apt to sit behind a desk all day. It was more effective to teach him his spelling words while he did jumping jacks, or read to him classic literature curled up on the couch. We found that doing science at the park or in our back yard was successful as well. So we adapted our methods. As we added more children to our family, I found myself doing more Unit Studies. Now that the children are getting older, we have switched to doing the majority of their schoolwork with a computer program. And, if necessary, chances are we will again alter our approach to fit our family. When determining what style fits our family we should pay attention to not compare ourselves to other homeschooling families. I have noticed that homeschooling parents seem to be notorious at the comparison game. The Jones children are leaning Latin. The Smith children are three grade levels ahead in math. Our friends at co-op are using the newest science curriculum. And so on. It is an easy trap to fall into. And yet it must be avoided for the well being of the family. The Bible warns us of this. “For we dare not make ourselves of the number, or compare ourselves with some that commend themselves: but they measuring themselves by themselves, and comparing themselves among themselves, are not wise,” 2 Corinthians 10:12. It is not wise to compare ourselves to others because we are not them. We must seek the Lord and His standard for our family and stop comparing ourselves to everyone else. God created us unique. He created our family unique. Unless we embrace our differences and do what works with our family, we will constantly struggle in our homeschooling. As the old adage goes, “Do what you love and you’ll never work a day in your life.” Likewise, consider the wisdom behind this saying, “Give a child a love for learning, and he’ll never be in school.” If we can successfully instill into our children a true love for learning then the act of studies will not be a chore. This is a concept that I still have to go back to on a weekly basis. Sometimes lessons become mundane. But one of the greatest advantages of home education is that they do not have to be. We have a great freedom in how we teach our children. Math facts can be boring but if you have a daughter who loves to cook you can teach her fractions in the kitchen. She will have so much fun that she will not even realize she is learning. History can be a drab but if you have an auditory learner you can find some fascinating historical audio dramas to listen to in the car. This will help peak your child’s interest in history. Some children struggle with writing but are very proficient at sending letters to friends or writing emails. A wise parent will use these avenues to teach their children. My oldest son loves to work with wood; therefore, we have tried to use his passion as an opportunity to teach various subjects of importance. It must be said, however, that it will be difficult to make everything a child must learn fun and exciting for them. My son likes to ask the question, “Why do I need to learn this?” He continues with explaining that it is likely that he will never use this information in life. It is then that I take the opportunity to remind him of an important fact. It may be true that unless he becomes an engineer he might not need to know the high levels of calculus and trigonometry. But he will need to learn how to study. And unless he becomes a history major it is likely that it will not be necessary to memorize all the dates of every war. However, he will need to be able to sharpen his memorization skills. Studies teach us diligence. And that is unquestionably an attribute worth achieving. All children need to be trained in the art of hard work. And all of these things can come about by simply learning higher math or detailed history. With the right attitude, even learning tedious facts can be a joy to both the student and the teacher. When choosing a curriculum for your children remember these key factors. What foundation is it built on? Does it fit our family? Is it fun? What are others saying about it? And one final thought I would like to offer is on consistency. While consistency does not necessary play a part in which curriculum to choose, it does play a part in whether we become successful in this choice. We have found ourselves having to change a curriculum that was not working during the middle of a school year. But one thing that did not change was the consistency of doing that necessary study. The math curriculum might have changed but the study of math did not. Perhaps a reading or language curriculum is not working for your family. It is okay to adjust. Just be sure to continue to teach reading and language on some level. Maybe you are unsatisfied with a Bible program, that’s okay too. Just be sure your family is reading the Bible every day. A good rule of thumb for younger children is to be consistent in teaching the three R’s – Reading, wRiting and aRithmetic. An essential element in homeschooling is you, the parent, taking the God given responsibility for your child’s education. These decisions are important but you are not left to face them alone. Commit the path of learning your family will take to prayer. Trust in God to lead you. And keep your eyes focused on Him. “Let thine eyes look right on, and let thine eyelids look straight before thee. Ponder the path of thy feet, and let all thy ways be established,” Proverbs 4:25-26. SAHM – My family! My choice!